This is a plastic surgical procedure that either correcting or resectioning the form of the nose, restoring functional as well as aesthetically enhancing the nose by removing nasal trauma. Alternatively, congenital defect respiratory impediment or correcting a failed rhinoplasty. There are closed rhinoplasties and open rhinoplasties – an otolaryngologist (ear nose and throat specialist ) a maxillofacial surgeon ( jaw, face, and neck specialist) or a plastic surgeon creates a functional aesthetic and facially proportionate for the nose by separating the soft tissues, nasal skin from the osseocartilaginous nasal structure. Correcting nose to get the required for form and function, suturing the incisions and applying either package or stent or both to immobilize the corrected nose to ensure proper healing and surgical incision. Current medications, vitamins, alcohol and drug use. Previous surgeries you have had. Evaluate your general health and well-being – discuss pre-existing health conditions or risk factors that could be impacted or impact the rhinoplasty. Discuss the outcomes and likely risk or potential complications. Who are Good Candidates for a Rhinoplasty? Full grown and developed facial development is complete. Have the positive outlook and realistic goals about facial appearance. Rhinoplasty goal is to enhance the facial composition and portions to the nose. Rhinoplasty changes the size of the nose in relation the rest of the face. Change nose width at the bridge or in the size and position of the nostrils. Nose profile by eliminating or changing visible humps or depressions on the bridge. A nasal tip that is enlarged or bulbous drooping, upturned or hooked. Rhinoplastic cannot be used to correct a deviated septum along with a septoplasty. A deviated septum is a condition in which the nasal septum, and the cartilage that device the nasal cavity of the nose in half significantly of center, or crooked, making breathing difficult. This procedure helps improve obstructed airways and requires careful evaluation of the nasal structure and forms and how it impacts the airflow and breathing. How much is the cost of Rhinoplasty? The cost of a rhinoplasty is $4,694, according to 2014 statics from American SOcitye of Plastic Surgeons. The cost of a Rhinoplasty surgery can vary depending on many different factors. The average fee that referenced does not include another cost such as anesthesia, operating room facilities and other equipment and support expenses. Typically the fee is based on the geographical location of the office and the experience level of the surgeon. When should look for a board-certified plastic surgeon in your region for a rhinoplasty? You should always focus on the surgeons’ experience and your comfort and trust level you have with that him or her – this is just as important as the final cost of the surgery. Rhinoplasty and health Insurance coverage. When you are getting a rhinoplasty performed to improve the breathing function of an obstructed airway. It may be covered by your insurance, where performed alone or in combination with cosmetic rhinoplasty, we still considered reconstructive. This will require a detailed location to confirm the of your breathing impairment. What Are the steps happen in the Rhinoplasty Surgery? These are the medications that are admitted for the patients comfort level during the rhinoplasty procedure. The options include intravenous ( insert through the veins) sedation or general anesthesia. Your surgeon will recommend the best choice for you. Rhinoplasty is accomplished by either doing a closed procedure, where incisions are under the nose or doing an open procedure, in which an incision is made across the columella, This is the narrow strip of tissue that separates the nostrils. With these incisions, the cartilages and skin that covers the nasal bones tenderly raised. This allows the surgeon to access to reshape the structure of the nose. 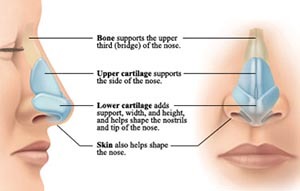 A large nose may be decreased by removing extra bone or cartilage. In some occasions changes to the nose may need the addition of cartilage grafts. 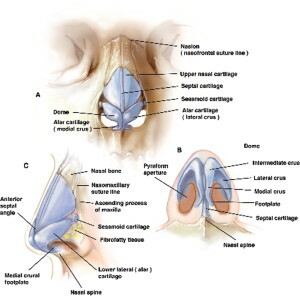 More commonly, cartilage from the septum, which is the separation in the center of the nose, is used for this purpose. Sometimes the cartilage from the ear or in rare cases a section of rib cartilage can be used. If the septum deviates, it can be arranged and the projections inside the nose reduced to enhance breathing. Once the cartilage and tissues below the nose are sculpted to the shape, tissue, and nasal skin are redraped, and incisions are joined. Further incisions may be placed in the natural creases of the nostrils to adjust their size. For the initials few days, gauze packing and splints will support the nose as it begins to heal. Get more information about rhinoplasty results. If your are recovering from a rhinoplasty procedure, your doctor will place a split and/or packing inside the nose, or a splint and bandages outside the news to support the new structure of the nose during the healing process. You will experience initial swelling and will see the subside within a few weeks. It can take up to a year for the new nasal contour to be fully developed and refined. During this time, you may see gradual changes in the appearance of the nose as it gets closer to the permanent outcome. Swelling may com and go, and it may be worst in the morning during the following year of the rhinoplasty. How to take care of the surgical site. Symptoms to look for after the surgery that may affect your general health. Where should I go after my surgery is complete? What medication should I take after the surgery? While I have dressing and Bandages after the surgery? How often Should I change them? Will I have stitches? How long will I have to keep stitches, which will remove them? When can you resume normal activities and exercise? When do you need follow-up care? The direction to have an a rhinoplasty is a personal decision that you will have to determine for yourself. You will have to weigh the benefits against the risk to achieve your goals. 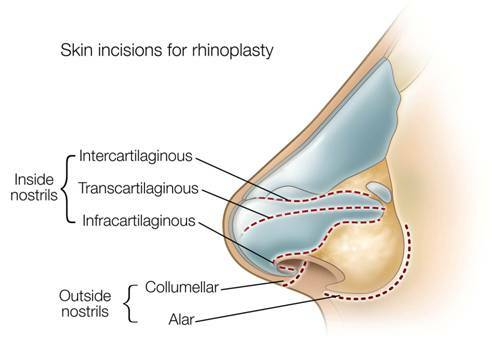 Your plastic surgeon and staff will explain in details the risk associated with the rhinoplasty. You will be asked to sign consent forms to indicate you fully understand the procedure and its risks or complications. Posted in Rhinoplasty Tagged Cost of a rhinoplasty, Rhinoplasty, should I get a nose job?